WKU geology student Deborah Flynn conducted undergraduate research this summer on the Ethiopian Plateau, Ethiopia. 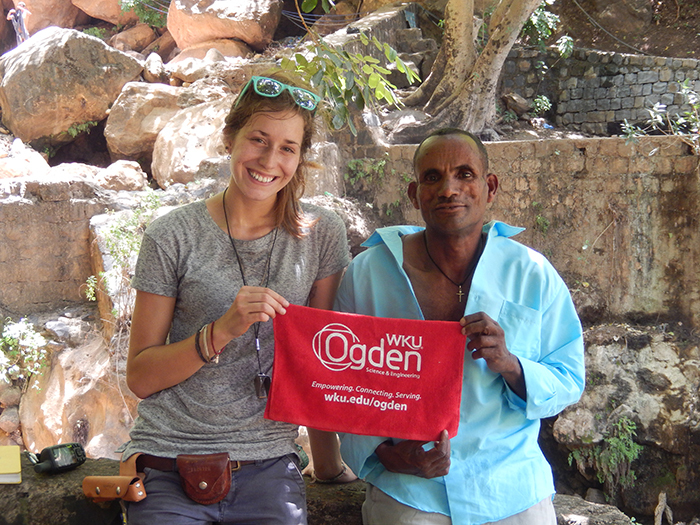 Flynn’s summer project was funded by a WKU Office of Scholar Development Lifetime Experience (LTE) grant and an Office of Sponsored Programs FUSE grant, and by an ACS-PRF grant awarded to Dr. Nahid Gani in the Department of Geography and Geology. Flynn conducted fieldwork on the Ethiopian Plateau, specifically to the north of the capital city, Addis Ababa. She identified and measured geologic structures such as normal faults, resulting from extensional tectonic stress, along the Blue Nile River. She collected GPS-based field data, including strike, dip and dip directions, while photographing various geologic features. The main objective of the project was to quantify the fault permeability potential or Architectural Index by quantifying various different widths within a fault zone. A ratio was derived, which classified most of the faults in the area as conduit-barrier structures. This is the first time Flynn has traveled to East Africa, providing her invaluable and hands-on field experience. This experience not only allowed her to explore and collect data for her undergraduate research but it also helped her to understand the interaction between geology, environment and people. “The geology and culture were amazing, and I hope to return and continue researching the control of the Ethiopian Plateau geology on water resources and development solutions in the country. It was truly an eye opening experience! It was a wonderful trip,” Flynn said. She will present her fieldwork-based research findings this fall at the Geological Society of America Annual Conference in Denver, Colorado. She is also synthesizing and interpreting the data for a manuscript to be submitted to a peer-reviewed journal.